Your nurturing of poetry in Scotland is well-known, and your belief in free (or at least widely accessible) arts is indefatigable. In the light of this, could you explain to NLP readers how Poetry Scotland came about, and what its’ purpose is? Poetry Scotland began with the appreciation that poetry is a community, and one in which many practitioners were getting short shrift. At the time (1997) these included women, those who lived in far flung places, Gaelic poets and others. Many things have changed since then but not the need to understand the community and support it. Poetry Scotland‘s closest predecessor was Hayden Murphy’s The Broadsheet which ended shortly before we began. Making his headquarters a Dublin pub, Murphy collected poems from the poets he met and published them quickly, frequently and without critical fuss. It got poems out of people’s notebooks into the open air. That’s what Poetry Scotland has always tried to do. Its observed success led to the new formats of NorthwordsNow and the Eildon Tree. Although Poetry Scotland began by in some ways challenging the establishment, time has gone by and several now well-known figures, poets, editors etc were published either in Poetry Scotland or our diehard books before they became high profile. With most of them I am still on good terms, so although we are disestablishment, we have friends and colleagues in most poetry circles, particularly in Scotland. Poetry Scotland has also been lucky to have poems from some very high profile people indeed, Les Murray and Paul McCartney coming first to mind. Such poems are solicited (and if necessary paid for) as an encouragement to the other poets we publish. Libraries are being shut down. Bookshops are failing. Secondhand and new book shop owners such as you and Allan Harkness (another NLP contributor) at the Forest Bookshop in Selkirk are threatened. Could you explain the ethos behind your home for books and book-lovers in Callendar and how you aim to stay afloat in this oppressive climate? Kings Bookshop Callander is the continuation of Old Grindles Bookshop, which my husband and I started in 1987 and moved, continuously trading, from the Westport area in Edinburgh in 2000. Grindles in its turn had been the home of Poetry Scotland, poetry and play publishing, and various poetry and drama including Edinburgh Fringe fringe events, which were among the seeds of the Westport Festival in recent years. 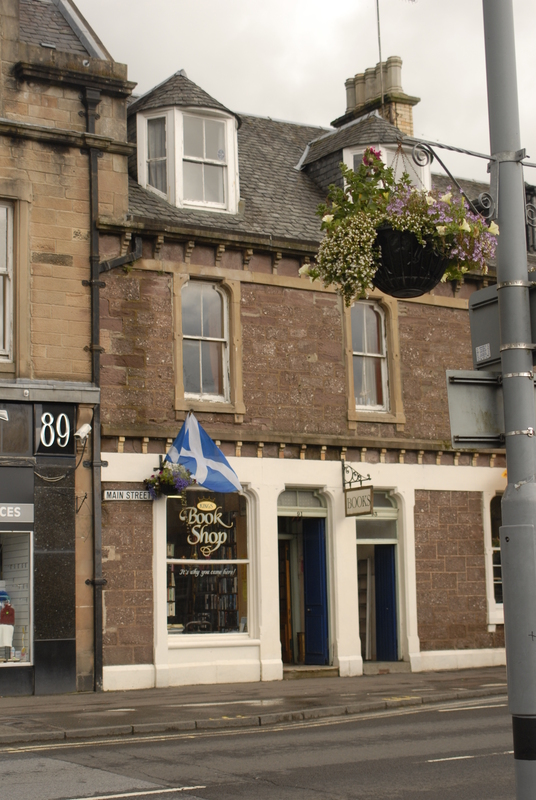 We moved our home and our bookshop to Callander simultaneously and it nearly killed us. It certainly wrecked my car, taking the lead type and printing presses the van man refused. But it has proved well worthwhile. At a time when other booksellers were moving into the Borders to be nearer the English supply lines, we decided to go further out into Scotland. We have a garden and a bindery, both of which we really needed for the sake of our sanity. We are just on the edge of the Highlands, an hour from Edinburgh or Glasgow by road and among the lochs and landscapes that have inspired my writing. I love it here. It is a delight to be constantly visited by poets and book people and have conversations that are often more open and relaxed than those in the cities. We run an annual poetry weekend which has helped to shape other festivals, with its friendly atmosphere, inclusiveness, food and fun. We could hardly have started all this without the initial period in Edinburgh getting to know the scene. As for surviving, the top end of the trade is an international market and our bindery is establishing a quiet little reputation of its own. You can’t fail to survive if you can take a fifty quid burst book and turn it into a £700 full morocco and gold leaf masterpiece. You have to know your books to be able to do that. The recession has not passed us by: it has not left anyone unscathed. But by luck and sensible planning we can survive. Unusually for publishers I think, we do not drink and we almost never eat in restaurants. Facebook suffices instead! You have embraced ‘new’ technology in your blog and in your involvement with a burgeoning poetry population on Facebook. What future do you see for ‘traditional’ books and journals versus the boom in e-books, and e-journals like NLP? We could not have continued to publish in Callander without the internet, whose benefits include being able to live everywhere at once, to communicate instantly and widely, and not to be held back by cartels and filtering agencies and controllers of information. I have nothing against e-books but I don’t think they’ll threaten the real book. There was always a big argument about public libraries affecting bookshops but they never did. You could look on the Kindle as a sort of library card. Our debt to traditional books and the printed word is an underlying one. Printed books have seen us out of medieval times and given us a grip on history as against propaganda. The future will be a world of both electronic and printed text, but I do feel that e-publication can be tampered with. It does not have the finality of something like a folio Shakespeare, a Darwin first edition or printed war memoirs. Texts cannot be changed so easily once they are in print, and there are those who would like to change them. Another feature of real books is they are, or should be, beautiful objects. Here our bindings, our books in excellent condition, come into play. Who are your poetic heroes and heroines, and who are your favourite people writing poetry in Scotland, or further afield, at the moment? I read right across the board and I no longer have favourites. Proust and Joyce did some things best. I liked Lawrence when young, as people should, and Samuel Beckett, and I don’t think Western literature has ever got much better than where it started, with the Greek and Latin texts. Auden and Yeats I most admire. I’ve never quite got to the bottom of hearing that Auden came from County Durham, Allendale or somewhere. In what sense came from? I’ve had crazes for women novelists, Jane Duncan and Elizabeth von Arnim, for instance. I very much welcome the women’s poetry movement which is much more recent than people realise. But I’ll read everything. I’m surrounded by writers. My son writes plays and my nephew is publishing books for young people. I’m not going to mention current names because I know almost everybody. Most criticism is way premature. Since The Bees I’ve done a pamphlet with Firewater Press in Bristol – The Honey Seller , and another based on William Burrell – the whole story, not just his antique dealing. I discovered that Burrell’s reclusive daughter Silvia Burrell left her fortune to the RNLI. So starting with the Grace Darling story and Burrell’s ancestors in Northumberland, I wrote a sequence through 200 years of shipping dangers right through until the new Girvan lifeboat Silvia Burrell was launched in 1993. I’ve been writing some poems about the history and Palace at Stirling Castle, with a group of writers who meet there regularly. We’ve prepared an exhibition and are doing a booklet, both with a mixture of poems and stories. And I’ve been taking part in collaborations for Chicago Calling Festival for four years now, and that’s ongoing. I’m hoping there’ll be a new book fairly soon including my sequence Anderson’s Piano, based on the train derailment in the Pass of Brander. Some of these poems have been published separately, some in Gutter. And there’s talk of a book of my translations of some of Christopher Whyte’s Gaelic poems, along with those of Niall O’Gallagher. NLP enjoyed your epic work The Bees from 2008, a theme more recently worked on by the Poet Laureate Carol Ann Duffy. Could you describe for NLP readers the format of your book, its genesis and the artwork that accompanies it? The Bees was fun, fun to write and fun to publish. People liked it. It’s a fantasy: an elephant artist follows the bees round the highlands. It’s written in a special version of terza rima with a 7-beat line in every tercet. It has a prologue, epilogue, 7 cantos of equal length, a pre-poem and some haiku. I had written a book length poem before — Millennial, which I decided was slightly ponderous, and I was determined to write something lighter. 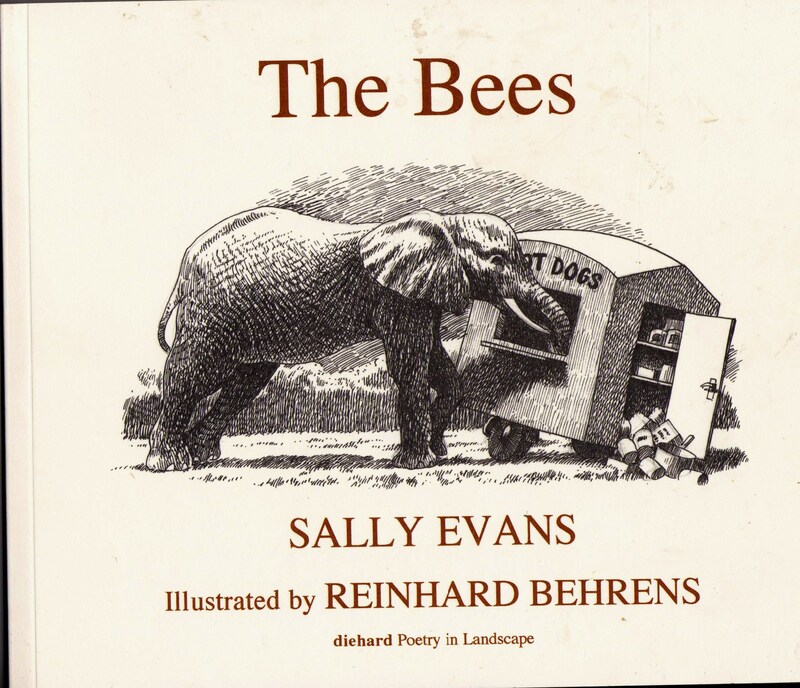 The Bees came out well, but it seemed unpublishable in practical terms, until Reinhard Behrens’ wonderful pen and ink drawings came along. I was very lucky indeed to get them. Reinhard picked out the elephant – “the irrepressible Tramp!” as he described him, as the key to the story. A landscape book was the result. Because of the shape of the book, no publisher could have taken this on but ourselves. I don’t know how the poem happened. My delight at living in the country again, after decades in cities, is there. But “Why has an elephant hi-jacked this poem?” I do not know. Your poems explore the nature of writing poetry (NLP remembers the Muse personified as an “infuriating lesbian and untameable arts administrator” in ‘The Poem WILD BOAR’ for Scottish poetry journal Gutter). What for you are the personal and social responsibilities (and difficulties) for poets and their poetry? For a poet, one’s first difficulty is deciding one is a poet — with or without (or despite) encouragement. After that, things should be clear. I think it is better for poets to find a living in the world, to save them becoming slaves to the system, as so many have become today. Many people will never understand what being a poet means, so in some circles (often your family) you are kind of underground. And others may not take you as seriously as you do yourself (if you do). It is all rather a solitary business and it is really between you and your life, so other people don’t come into it. But you can find great friends in fellow poets. The Bees also muses on themes of life and death, nature, and the environment, but this part of the Prologue particularly interested NLP: “So we, tho’ born of individual mothers/ and not so mass-produced as bees, each one’s/ a part and parcel of our peers and brothers”. NLP sees all art as a re-imagining of the past – how do you feel about this statement? Books (and an antiquarian bookshop) are an excellent place to start getting to grips with the past. Here are the writings of our peers and brothers — you see we must take responsibility for being good writers, joining their ranks. And we can learn to cross the boundaries between people, to go beyond the individual, and that is something that the social media are helping us to do at present. People — individuals — are way ahead of the political systems at the moment, due to this growth. “We thrive on in-betweens. We hesitate. We are transmuters/ of black and white to colours, which we love” (from Canto V, The Bees). You clearly love the vagaries of language, be it Scots, Gaelic, Latin or English, and at times The Bees feels like a dictionary for a hidden ‘in-between’ country. Does this place exist? Place is very important to me. I have found my own answers by living in Scotland and becoming Scottish. It’s that very slight distancing that writers are often aware of. But sometimes I love Cardiff, London, Newcastle, and feel torn. Honey is the bees’ “art, our god and our good turn”. This seems to NLP to evoke well the atmosphere of the whole book, your poetry, and to some degree perhaps your life, and led NLP to describe you as a quiet radical. Are you either of these things? Publishing and writing are not about “more of the same.” If you are not a radical, you are just wasting ink. I’m a quiet radical who can talk my head off. I’m not fighting anyone about it. I’m a radical because I’ve thrived on a degree of exclusion that came from not being Scottish, from being a woman (in early days), and from being an outsider. With my equally radical husband Ian W King, the publisher, bookbinder, bookseller, one time fiddle player and Scot, we have found a way of turning books into our living and our way of life. The exclusion is breaking down, but it has given me the legacy that I will always listen to outsiders. They have a lot to give. 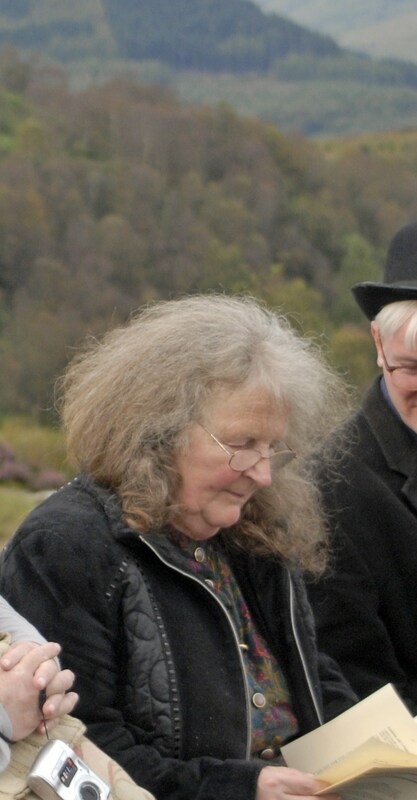 Sally Evans lives in Callander, where she sells books, writes poetry, edits Poetry Scotland, manages a garden and keeps chickens and bees. Enjoyed it very much, Sally.